May brings us National Meditation Month—a good reminder of the importance of helping loved one’s reduce their stress levels and lead a calmer more joy-filled life. Many doctors agree that meditation or mindful awareness can be a contributing factor in the search for mental, emotional, and even physical health. A report in Brain, Behavior & Immunity concluded that eight weeks of training in mindfulness meditation led to a decreased sense of loneliness in seniors. 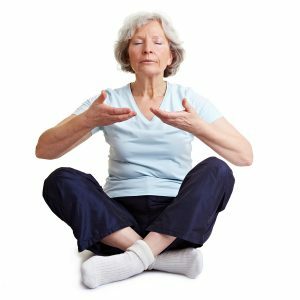 Forty people between the ages of 55 and 85 participated in a Mindfulness-Based Stress Reduction program. Part of this included meditation practice for 30 minutes a day. In addition to reducing loneliness, researchers found a reduction in inflammation-related genes. These contribute to a wide range of health related disorders, including arthritis, cardiovascular diseases, and cancer. Senior’s that regularly meditate have been shown to benefit in other ways as well. Meditation can improve both long-term and short-term memory. Stimulates the prefrontal cortex—an area of the brain responsible for feelings of happiness. According to researchers at John Hopkins University, mindfulness meditation has been shown to reduce depression, anxiety, and pain. Deep breathing exercises associated with meditation can help with digestive disorders by improving circulation and increasing the supply of oxygen. Meditation reduces stress, which has been associated with muscle aches, headaches, sleep disorders, and increasing irritability. Due to the increasing awareness of the benefits of mediation, many local senior community centers as well as YMCAs offer classes. Recordings can be found on YouTube as well as on www.mindfulness-solution.com, a website with free guided recordings by Dr. Ronal Siegel, an assistant clinical professor of psychology at Harvard Medical School. Guided visualizations which include focusing on relaxing the body from the toes up to the scalp as well as visualizing yourself in a relaxing environment such as on a white sandy beach or in a mountain meadow. Gentle exercises that are designed to promote mindful awareness such as tai chi and yoga. Promoting a relaxing and stress-free environment by listening to calming music such as nature sounds or music designed to relax. Another important aspect of life that contributes to reduced stress is maintaining social contact and an engaged lifestyle. An elderly care provider can not only assist your parent with everyday activities, they can provide the companionship and care so important to a stress-reduced, happy lifestyle as one ages. If you or an aging loved one are considering elderly care in Middletown, NJ, please contact the caring staff at Lares Home Care 888-492-3538 or 732-566-1112.